East Side Collection™ Puttin' on the Glitz Sweaters Offer Glamorous Style. 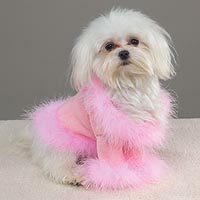 Elegant sweaters with maribou feather trim and a rhinestone necklace accent give dogs a classy look for any occasion. Acrylic knit sweaters feature a Velcro® closure for an easy fit and an adjustable tie on the back. Wipe clean with a damp cloth. Puttin' On the Glitz Sweaters are available in the colors and sizes listed below.